This Blueberry Peach Quinoa Salad is summer in a bowl and perfect to feed a crowd at your next BBQ! 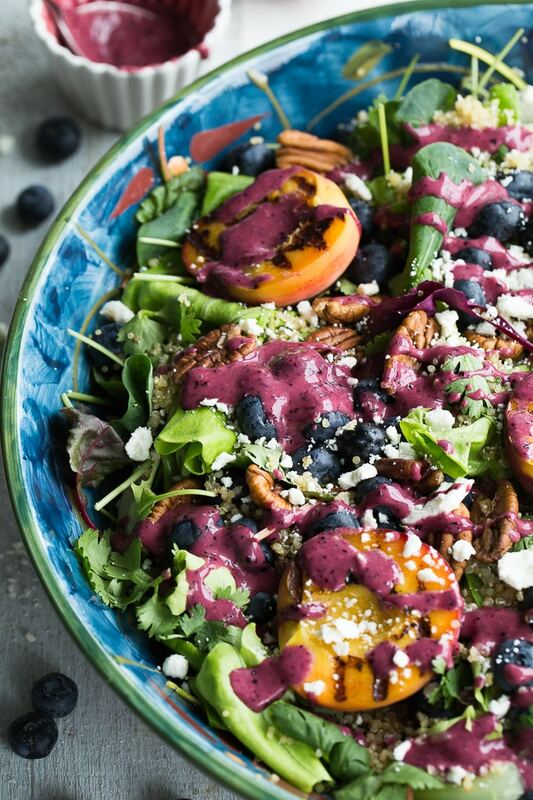 Loaded with greens, quinoa, blueberries, peaches, pecans, feta and topped with a tangy blueberry peach balsamic vinaigrette, this one is delicious, hearty and easy to make! *This post uses gifted product from Sutter Buttes Olive Oil Company. As always, all opinions are my own. 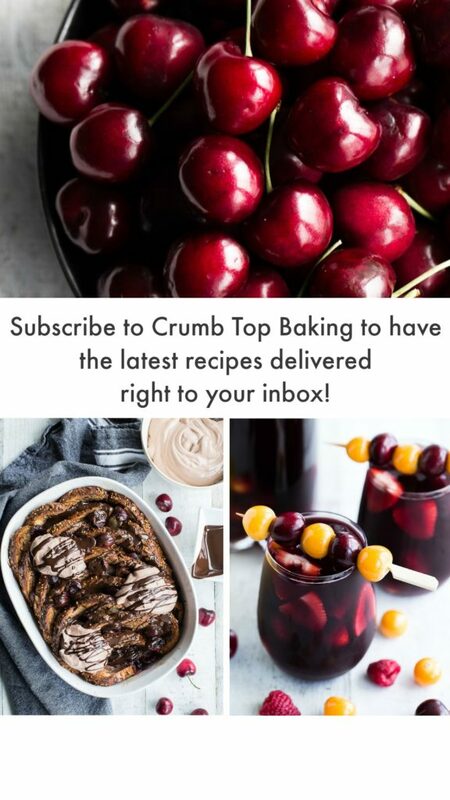 Thanks for supporting the brands that make Crumb Top Baking possible. Happy July! How is summer treating you so far? I gotta say, summer is just teasing us here in Newfoundland. We’ve had a few nice days, but for the most part, it has been cold and dreary. That’s not completely unusual in these parts, but it’s still disheartening. When the sun is shining, everything seems just a little rosier, don’t you think? Thankfully, it looks like temperatures are warming up this week, so I’m getting my BBQ sides in order for lots of grilling! A few weeks ago, I shared this Spicy Jalapeño Turkey Burger, and I’m not going to lie, it has been on repeat in my house despite the lack of BBQ weather. And lately, And I’ve been pairing these burgers with this Blueberry Peach Quinoa Salad. It’s the perfect summer meal! I eat a lot of salads. Most days, I have one for lunch or supper. So I’m not sure why I haven’t shared more salads here on Crumb Top Baking. I’m hoping to change that over the summer and share a few more salads….balanced with frozen treats of course! Because that’s what summer is all about, right? Light food and frozen desserts?! But for now, let’s focus on this Blueberry Peach Quinoa Salad. When I say this salad is easy, I’m not kidding. It comes together quickly and it’s totally customizable. Other than the essentials of blueberries, peaches and quinoa, the rest is really up to you! This recipe is for a family sized salad, but if you want individual servings, you can just quarter the recipe. You will need 5-6 cups of greens for this salad. In the photo above, I used a mix of chard, kale, beet greens and boston lettuce. But I’ve also made it with arugula and spinach. Just use whatever greens you have on hand. I also added a cup of fresh cilantro as I love the flavor twist it adds. If you’re not a cilantro lover, you can omit it or use fresh parsley instead. This recipe calls for grilled peaches, but if you’re pressed for time, you can use sliced or chopped peaches. To keep it simple, I used raw pecan halves in this salad, but you can also use chopped pecans, or even candied pecans. Walnuts or sliced almonds would also work well. If you want to make this a heartier dinner salad, you can add some grilled chicken, tofu or shrimp! 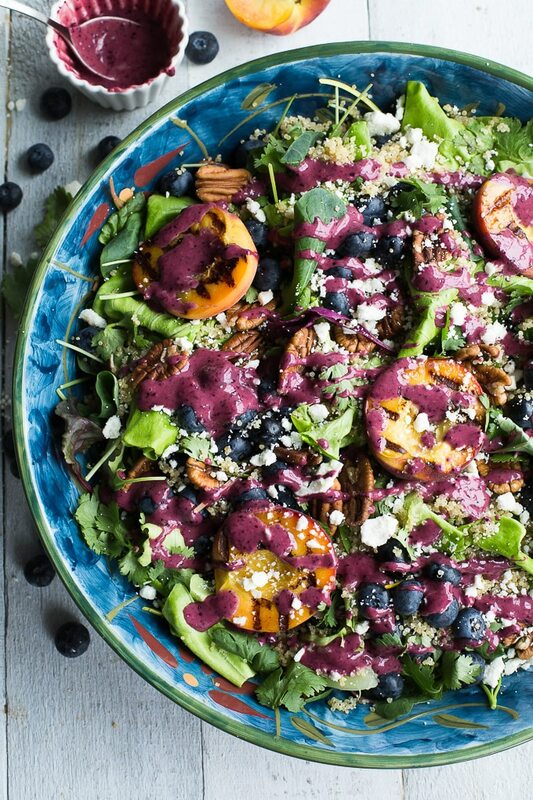 Perhaps the best part about this salad is the blueberry peach balsamic vinaigrette. It’s sweet and tangy, with a slight creaminess and a pop of colour that takes this salad up a notch! I recently received some free products from Sutter Buttes Olive Oil Company, one of them being a peach balsamic vinegar. 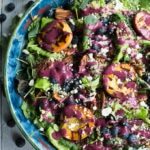 I knew I wanted to try this vinegar in a homemade vinaigrette, and given it’s peach season, what better salad to pair it with than a blueberry peach salad! If you haven’t tried homemade vinaigrettes yet, they are so easy, and much better for you than most store-bought dressings. This one blends together the peach balsamic vinegar with blueberries, evoo, and honey. It’s pretty basic, but adds a tang and sweetness to the salad, and pairs nicely with the salty feta cheese sprinkled on top! And if you can’t get your hands on some peach balsamic vinegar, no worries. I’ve included an alternative recipe in the notes that uses peaches and regular balsamic vinegar! 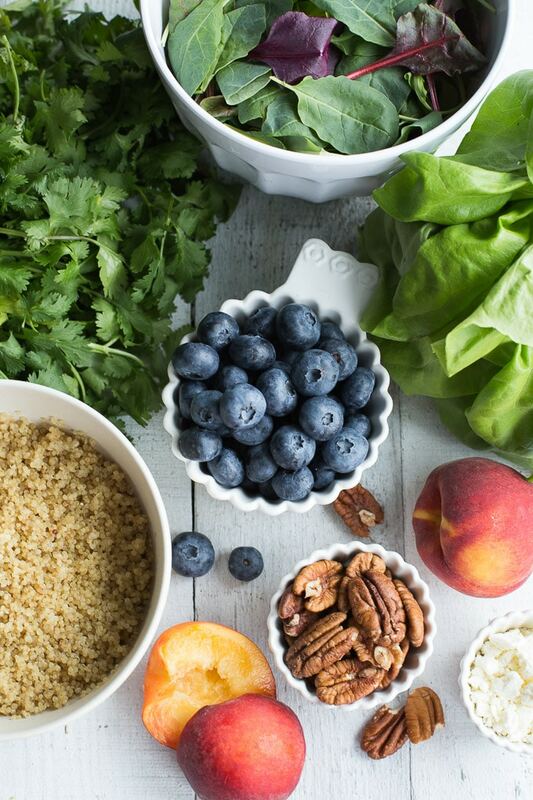 If you decide to make this Blueberry Peach Quinoa Salad, I would love to hear about it in the comments below. This Blueberry Peach Quinoa Salad is summer in a bowl and perfect to feed a crowd at your next BBQ! 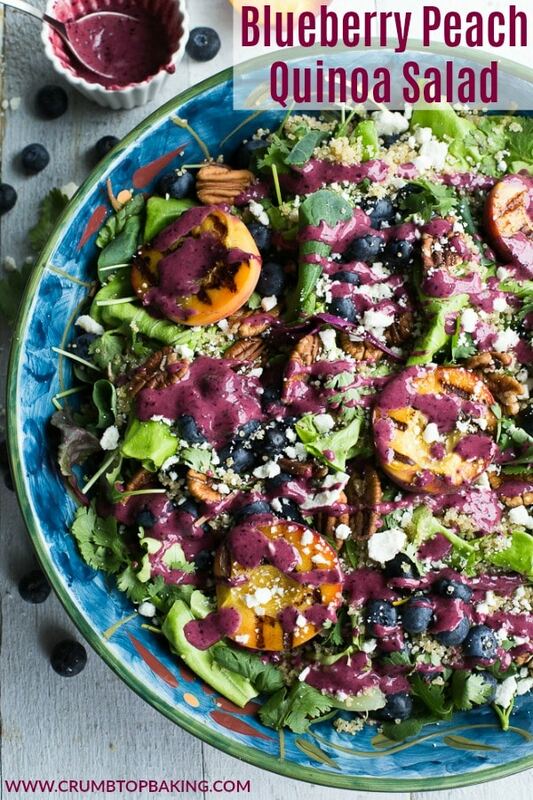 For an added punch of flavour, top it with a tangy blueberry peach balsamic vinaigrette! Assemble the salad: Arrange all the salad ingredients in a large bowl. Make the vinaigrette: Combine all the ingredients for the vinaigrette in a blender and blend on high until smooth. Serve: Drizzle the vinaigrette over the salad and serve! To grill the peaches, just cut in half and remove the pit. Brush the cut side with olive oil and place cut side down on the grill for 3-5 minutes. You can flip and grill on the other side if you like, but to keep the peaches firm for this salad, I only grill them on one side. If you want more tips on grilling peaches, The Kitchn has a great post. If you don’t have time to grill your peaches, you can use sliced or chopped peaches. If you’re not able to find peach balsamic vinegar, you can substitute with one chopped peach (skin removed) and 2 tbsp balsamic vinegar. Blend with the other ingredients as per the recipe. Homemade vinaigrettes are best enjoyed fresh, so I usually make mine just before serving, and I make just enough for the salad. But if you have some leftover, store it in the fridge and when ready to eat, stir or shake until it regains its texture (it may solidify slightly in the fridge). This recipe makes a large, family sized salad. For individual servings, just quarter the recipe. Such a beautiful salad, Leanne!! I could eat salads all the time too, especially if they looked this good!! You say 4 servings, but I’m pretty sure it’s like two, lol. I know I’d want extra of this one 😉 Bring on sunny days, warm weather and all the summer food! Thanks Dawn! This is definitely a summery salad, and I’m pretty sure I could eat this in two servings too! Happy summer friend! Hope you’re having a good one! I absolutely love quinoa salads Leanne! And this looks so fresh and delicious for summer. I love that vinaigrette! Thanks Mary! I love the texture that quinoa adds to salads! And the vinaigrette is a must on this salad for sure! Oh my GOSH. The color of that vinaigrette is insane! Salads are one of my favorite dinners but I rarely make my own dressing. (I’m lazy.) I’ll be trying this one though! Looks amazing! 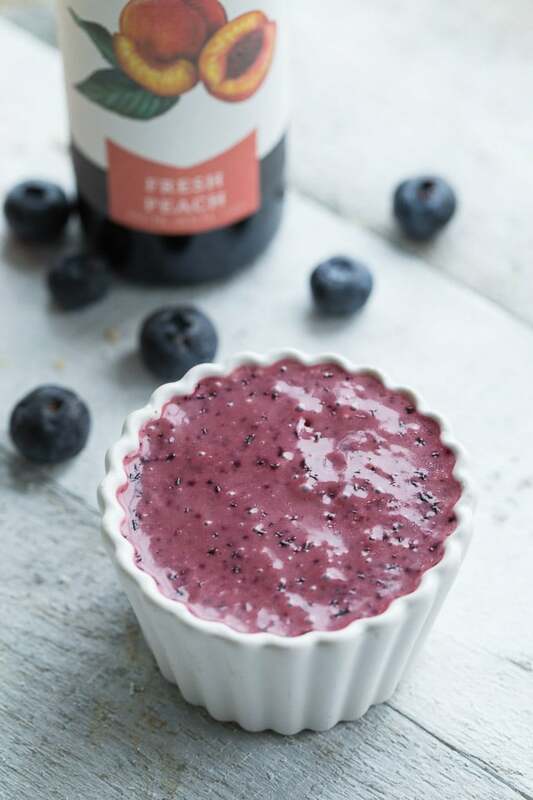 I never thought of blueberries and peaches going together…I will definetly have to try this! Such a beautiful salad Leeanne! 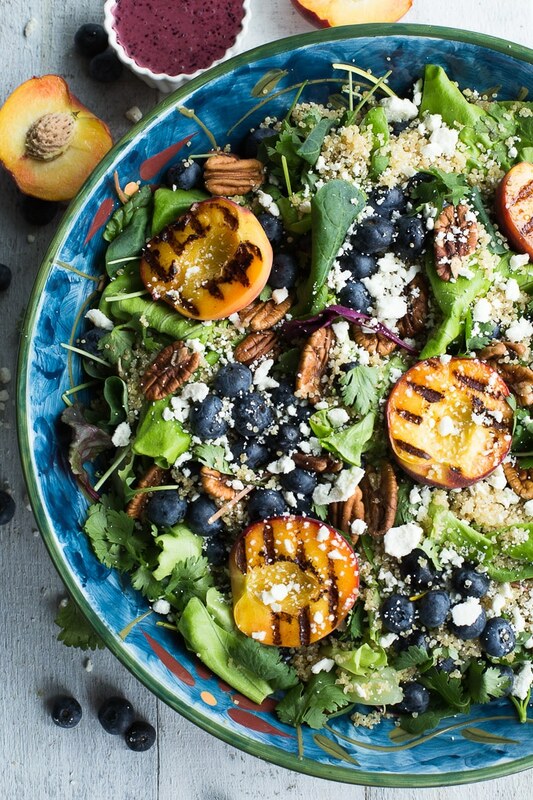 I love salads and I’m loving your blueberries and peaches addition with the quinoa! And YES that viniagrette looks to die for!! YUM!! Thanks Kim! I love this salad, but the vinaigrette is truly the best part! Thanks Ashika! It’s a lovely summer combo. I was eating it on repeat last week! Now I need to stock up on peaches again! We’ve been having an unbearable heat wave recently (up to 35 degrees C but feeling like 40 with humidity) in Nova Scotia. Luckily, it’s cooling down a little. But I’ll gladly send some of our hot weather to Newfoundland:) This salad is gorgeous, and it’s the kind of salads I love – beautiful and awesome! Thank you Ben! And I will gladly take some of your heat and humidity. Although we have been enjoying some nice temps lately (minus the wind!). Hope it cools down a bit for you! Thanks so much Jaclyn! I hope you like it. Would love to know what you think if you make it! Thank you, Denise, for your lovely comment! I love trying different oils and vinegars, especially in salads. I hope you get to try this recipe! Take care! Hi Leanne, your salad looks so delicious! Quinoa, grilled peaches, blueberry are such a colorful and tasteful combination! It’s a must try! Thank you for the recipe! Thanks so much Nathalie! Wish you could drop by to join me for some! Hope you’re having a lovely summer! The colour of that salad dressing is amazing! It sounds so delicious too… perfect for summer! Thanks Lizzy! I really loved how the salad dressing turned out – the colour and the taste! Thanks Heather! I love adding fruit to my salads, especially this time of year! I love this recipe! Would never have thought to use sweet or fruit with quinoa, but what an excellent idea! I hope to try this with some fresh summer produce! Thanks Terri! I hope you get to try it. The quinoa is lovely mixed in amongst the greens and topped with a sweet vinaigrette! Salads are the perfect light lunch or supper! And I love adding fresh fruit especially this time of year. Yes, yay to stone fruit! Thanks Katherine! Happy weekend. The salad looks beautiful and so delicious! The peaches are a fantastic addition to this recipe. Such a creative dish for the summer time. Thanks Christie! The peaches add a nice sweetness to the salad! Holy moly, those grilled peaches look utterly divine! Gorgeous photography and mouthwatering recipe!! Pinning!